Last July, Russian scientist Dmitry Lopatin almost ended up in prison after being charged with importing from China the solvent, gamma-butyrolactone, which is banned in Russia. Today, his latest invention is a new type of solar cell that is attracting attention from the world's leading oil companies, and his startup is entering the international market. 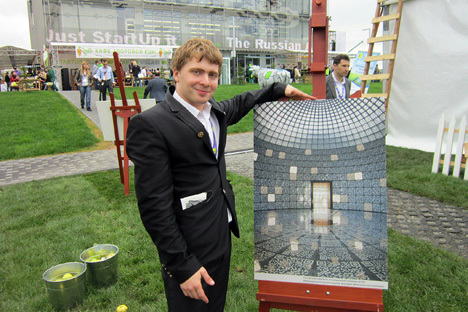 Russian inventor and entrepreneur, Dmitry Lopatin, is promoting his latest project, a new type of solar cell. The main feature of Lopatin's design is that it does not use the usual silicon, but instead uses perovskite, a calcium titanium oxide mineral. The inventor touts the new cells as more durable and cheaper than what is today available on the market. India is Lopatin's first target because the country is running a state program to provide its population with cheap energy. Next, he plans to enter the American and European markets. The project is almost ready for mass-production, and Lopatin is now completing the assembly of an industrial 3D printer that will be used to produce the cells. Lopatin became famous last summer when he was the main figure in a controversial trial, being accused of drug possession after having imported from China a liter of the chemical solvent, gamma-butyrolactone. He was unaware that Russian law considers the substance, "a psychotropic compound.'' Lopatin managed to prove he acted without malicious intent and that he acquired the substance only for scientific purposes; so the case against him was eventually dropped. Lopatin is well-known both inside and outside of Russia, and he unveiled his latest invention at the Hello Tomorrow Conference, an international summit of scientists and entrepreneurs, where he represented Russia. He is also one of the finalists of the GenerationS competition for technology startups. Lopatin's solar cells already have the attention of the oil giant, Royal Dutch Shell, and once his 3D printer is finished he will be able to produce 20 square meters of cells daily. Their main advantage is their surface material. Lopatin and his partner, Oleg Baranov, have invested $20,000 of their own funds in the project, with another $30,000 coming from private investors. They need a total of $300,000 to $400,000 to start full-scale production. In 2016, Lopatin plans to start selling his technology and the equipment to print cells. He has already set up a production facility in India at one of the factories of the prominent company, Tata. The choice of India as a production site was not accidental. That sunny country has a state program to increase the supply of electrical power to its population, and the investor plans to use state funding to continue research. Lopatin expects to enter the American and European markets by creating joint ventures with local entrepreneurs, and he said that 30 or 40 square meters of cells will cost between 2,000 euros to 3,000 euros to produce, which by his estimates should pay off for the average European family after a year or two of use. According to Alexander Zhurba, a partner at AIST Invest, Western consumers are making the transition to alternative energy sources, but the low prices on traditional fuel sources is slowing the growth of this trend in western nations.